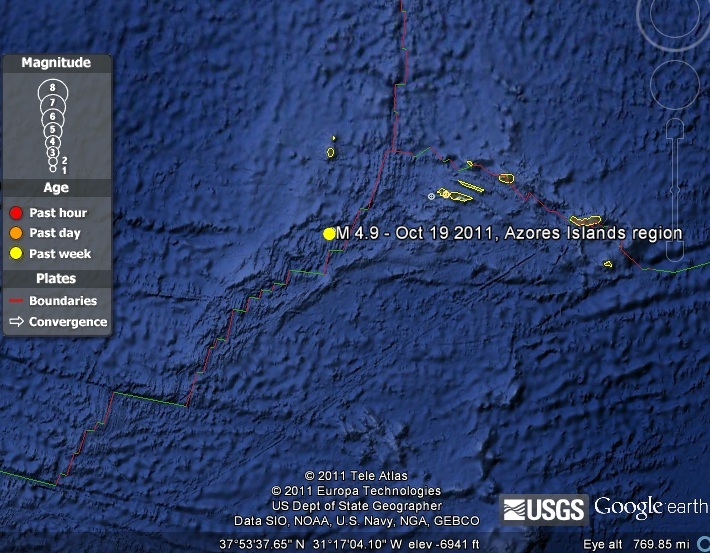 On Wednesday, October 19, 2011 an earthquake with a magnitude of 4.9 and depth of 7.6 miles hit the Azores Islands. The Azores Islands sit along the mid Atlantic ridge line. The earthquake occurred because of Slip -strike (transform fault) as the plate diverge , the curve of the Atlantic ridge grinds against each other in opposite direction. 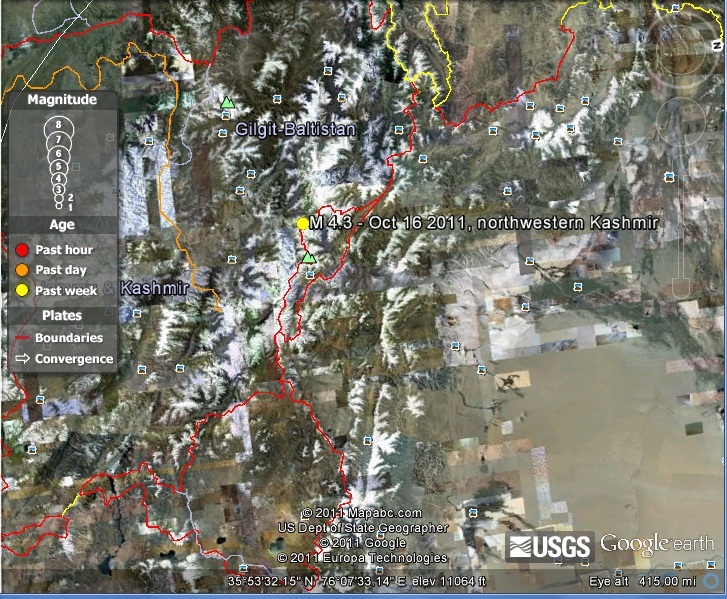 On Sunday, October 16, 2011 an earthquake with a magnitude of 4.3 and depth of 62.3 miles hit the Kashmir Mountain. The Kashmir Mountain quake occurred because of the continental collision. Eurasian Tectonic Plate colliding with the Indian Tectonic Plate. The Area is home to K2 Mountain, the second highest mountain in the world. 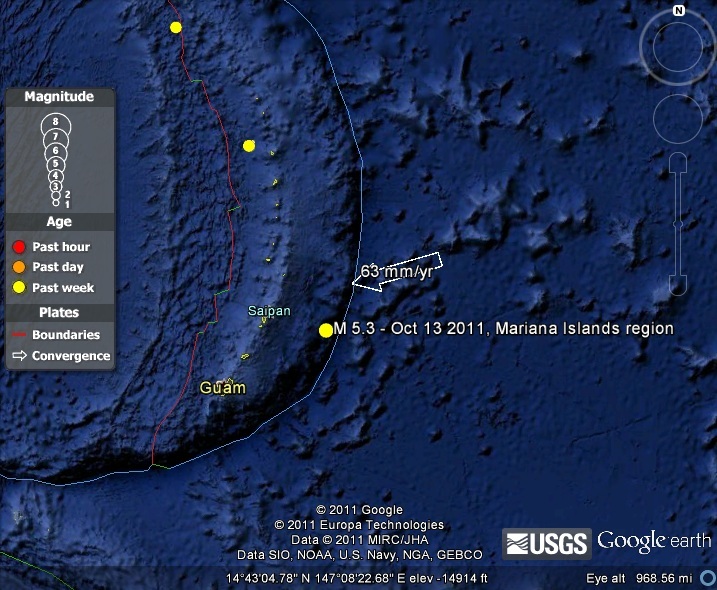 On Thursday , October 13,2011 an earthquake with a magnitude of 5.3 and depth of 21.7 miles hit the Mariana Islands. The Mariana Islands sit in the ring of fire area, where the Pacific Tectonic Plate converge against the Australian Tectonic Plate. The earthquake occurred as the Pacific Plate gets pushed underneath the Australian Plate through the process of subduction. 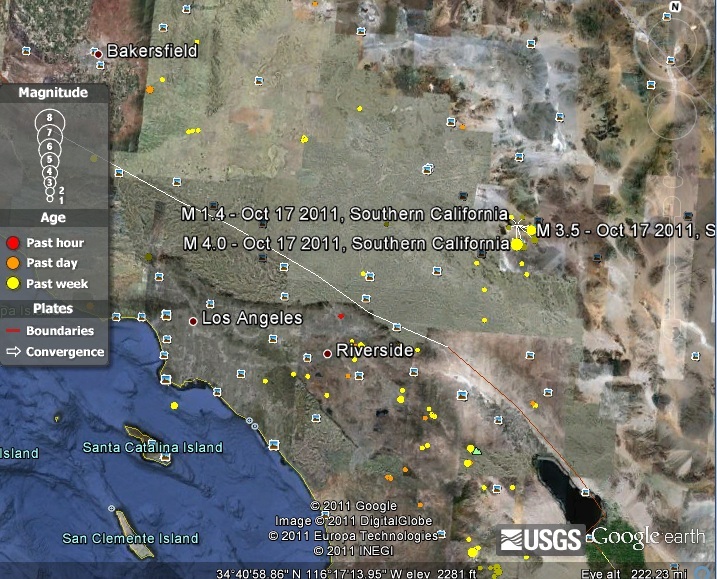 On Monday , October 17, 2011 an earthquake with a magnitude of 4.0 and depth of 0.7 mile hit the Southern California area.The Southern California earthquake occurred due to the San Andreas fault line. The San Andreas Is created by the North American Tectonic Plate moving south and Pacific Tectonic Plate moving north. 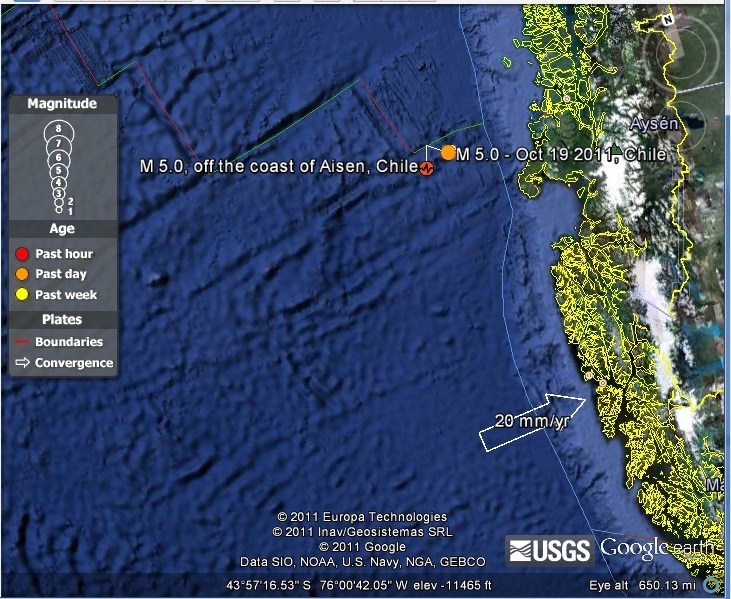 On Wednesday, October 19,2011 an earthquake with a magnitude of 5.0 and depth of 9.5 hit the coast of Aisen.The Coast of Aisen, Chile sits between Nazca Tectonic Plate and South American Tectonic Plate . The earthquake occurred due to Nazca plate converging against the South American Plate. Mount Vesuvius is a composite volcano located in the Bay of Naples, Italy. 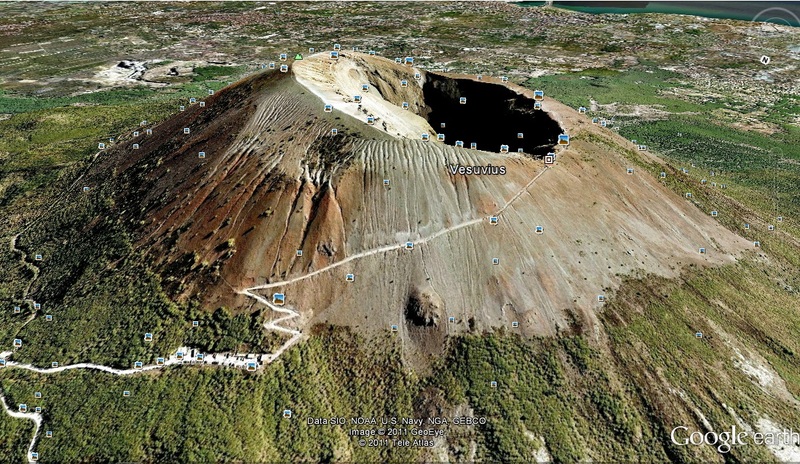 Mount Vesuvius stands tall at an elevation of 1281m(4,203 ft.), and produces Andesite lava . Mount Vesuvius volcano is form by oceanic to continental convergence, where the African tectonic plate is being pushed underneath the Eurasian tectonic plate. Mount Vesuvius is most famous for its eruption in79 AD, destroying the Roman city of Pompeii. 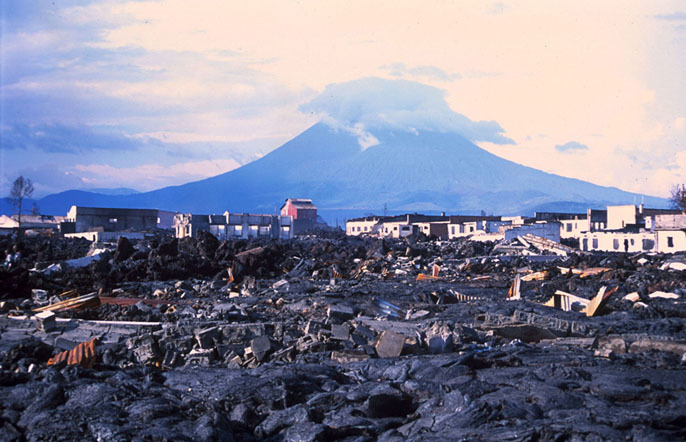 The eruption buried the city in ash, mud and rock, entombing its victim with ash. Mount Vesuvius is the only volcano that has erupted in Europe in the last 100 years, it last eruption was in 1944. Mount Vesuvius is an active volcano. 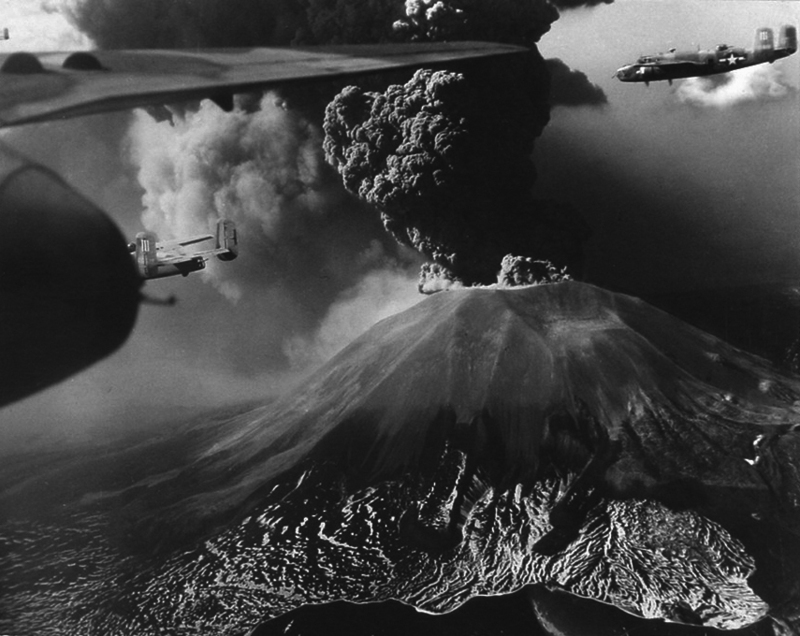 The Eruption of Vesuvius in 1944, picture taken by American pilot. Mount Nyiragongo is a caldera volcano located inside Virunga National Park, in the Democratic Republic of the Congo. 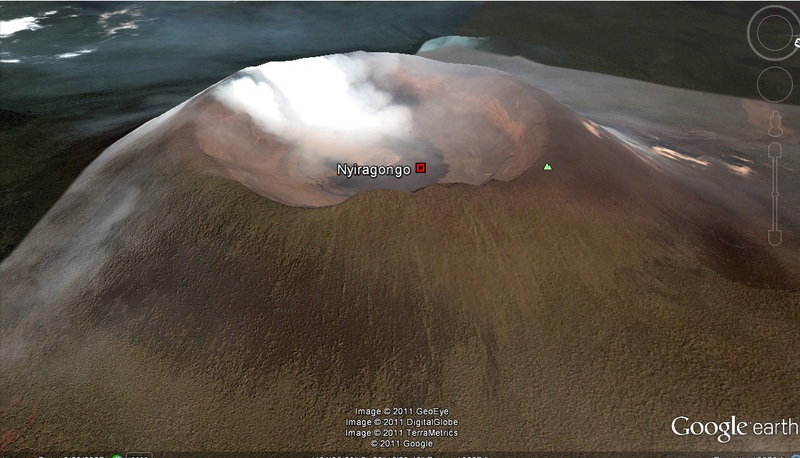 Mount Nyiragongo has a summit elevation of 3470 m( 11,384 feet), about two miles tall. 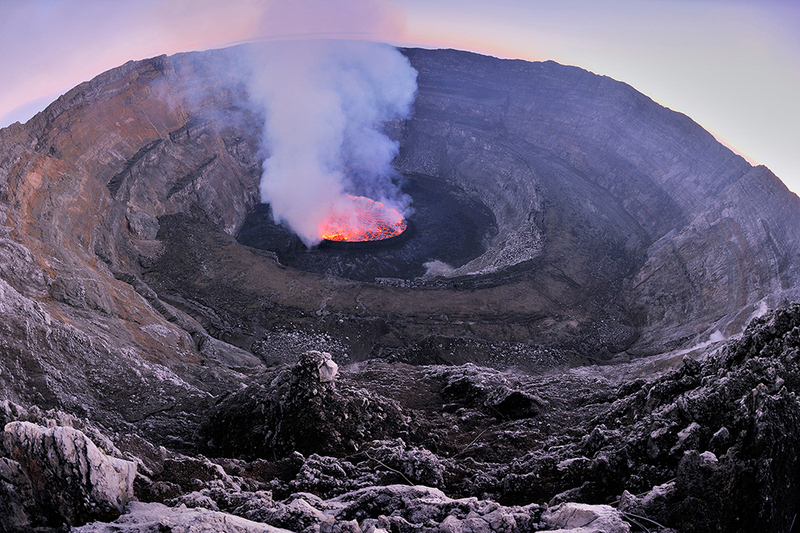 The main crater of Nyiragongo contains the world largest lava lake. The creation of Nyiragongo is due to the African tectonic plate breaking underneath, creating a hotspot. Mount Nyiragongo’s lavas are made of melilite nephelinite, with extremely low silica content, making the lava flow able to travel downhill up to 60 mph. Mount Nyiragongo last eruption occurred in 2002, which destroyed the town of Goma. Nyiragongo is still active. The Lava lake inside Nyiragongo crater. 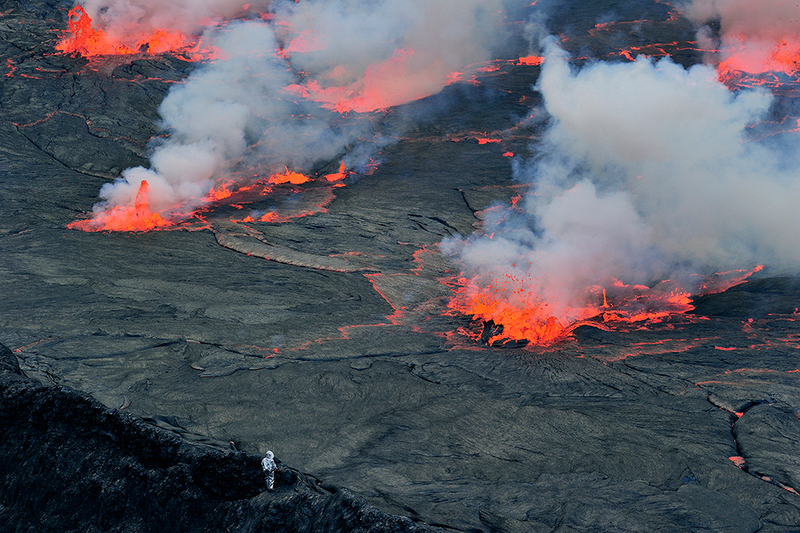 Scientist taking lava zero sample, which is age zero. The eruption of Nyiragongo in 2002, destroying the town of Goma. The Prestahnukur is a shield volcano located south west end of Langjökull icecap , Iceland. The Prestahnukur volcano has a summit elevation of 1400 m (4,593 feet), it produces basaltic lava flows. The name Prestahnukur means “peak of the priests”, the origin of the name came from the expedition of two priest. The last eruption occurred around 10,000 BC, the volcano has hot springs. The creation of Prestahnukur and other volcanoes , is due to Iceland sitting directly over the divergent fault line of the North American Tectonic plate and the Eurasian Tectonic plate. 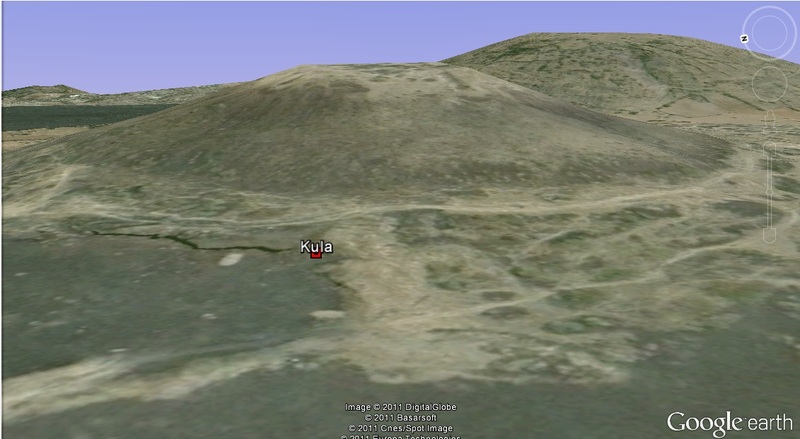 Mount Kula is a cinder cone volcano in Western Turkey. The summit elevation of Kula is 750m. Mount Kula last eruption was 10,000 years ago, it produces basaltic to phonotephritic lava. The Kula was form by the collision of Arabian, African, and Indian Tectonic plate against the Eurasian Tectonic plate. This convergence of tectonic plate, pushes Anatolian plate westward creating the North and East Anatolian fault zone. The earth is alive and in a constant mobile state, driven by radioactive decay and residual heat left from the creation of the universe. The planet is in a continuing process of decay and renewal, new magma pushes to the surface creates new soil, while older soil gets recycled into the asthenosphere. The hot magma in the mantle gets heated up in a process known as convection, pushes upward towards the surface .When the magma reaches the surface, the tectonic plate get pushed down in the process known as a slab pull. The tectonic plate or lithosphere floats on top of the asthenosphere, the hot magma area beneath it. This floating causes the plate to move grind, pushing, pulling, and colliding with one another. The contact of different plates at the fault zone causes earth quake and volcanoes. The earthquakes are caused when plate tectonic grinds against one another, the friction of these two plates causes seismic activity. The creation of volcanoes at these fault line are created when there is convergence or divergence of tectonic plates, this allows the magma from beneath to escapes to the surface. The activity of earthquakes and volcanoes always occur near these fault line, the only exception to no volcanoes appearing is when it’s a transform boundary. In a transform boundary, the plate are only sliding pass each other. The process of slip strike fault causes earthquake to occur, due to the friction of the plate grinding. Earthquakes and volcanoes are the results of Tectonic plate shifting in the earth.Volcanoes that are not near any fault zone, are called hotspots. These Volcanoes are form due to weak layer of crust in the lithosphere. The majority of earthquakes and volcanoes are distributed all around the world along the fault zone. Where ever there is tectonic plate activity, these natural phenomenal are presents. The activities of plate tectonic effect how much earthquakes or volcanoes there are. We can take a look at the pacific ring of fire to look at a prime example of how earthquakes and volcanoes are distributed. The ring of fire is literally covered all over by volcanoes and earthquakes. The outline of the ring of fire makes up pacific tectonic plate. The ring of fire starts with the convergence of the pacific tectonic plate against the Australian tectonic plate, Filipino plate, Eurasian plate, and North American plate. At the same time the Pacific is diverging away from the Nazca and Antarctica tectonic plate. The end result of all these shifting are the ring of fire. Anywhere we see a lot of volcanoes or earthquake activity is due to the existence of fault lines. This course has really opened my eye to how earthquakes and volcanoes operate. Before taking this course, I thought that these events were a mystery and that they just happen without any explanation. The only thing I knew about earthquakes and volcanoes were their destructive nature, and how terrifying they are to people lives. After taking this course, it has taught me, that these things occur not because of some unknown causes, but by movement of the earth tectonic plate. The reason why earthquakes and volcanoes happen is due to fault lines and pressure beneath the earth. There is also a positive side to these natural destructive forces, creating new landscapes, mountains, fertile soil and rich mineral deposit. The course has helped me get a deeper understanding of how our earth works, and the realization that Gaia is alive. Our world is in constant destructive and renewal state. I realize now that the world is still very much connected, we may not be like Pangaea, but what happens in one area of the world affects us all. 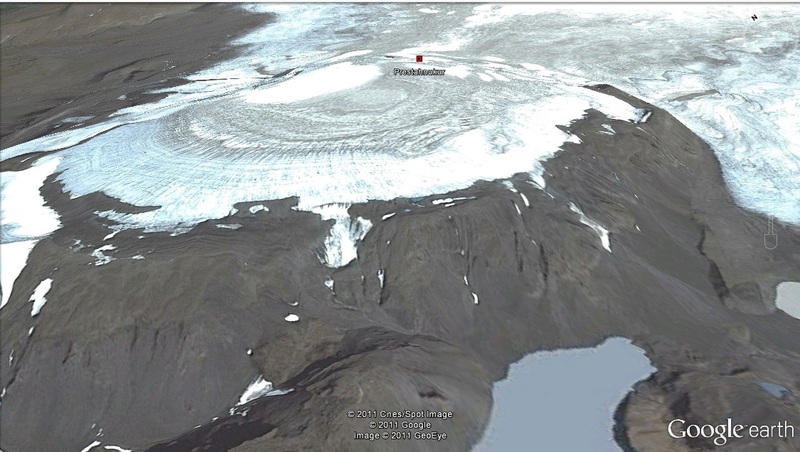 A volcano explosion thousands of miles away, could change the temperature of the world. An earthquake in a middle of the ocean could mean a tsunami hitting the shore a thousand miles away. The plates underneath our feet are all connected, converging, diverging and sliding against each other in perpetual motion. Our planet is alive and we are here just for a brief moment in earth existence. What I come away from this course is a greater appreciation and respect of our amazing landscape, how it’s been shaped and molded over hundreds and thousands of years. The natural disaster and elements that shape our world is very important to life on earth with out it, everything could cease to exist. A life without these natural wonder of our planet is a life unnatural.